Reading Quiz: Chapters 4 & 5: These questions are "sesame street" style. Students receive four items. Then, they must explain HOW three of them are connected and WHY the remaining item does not belong. I've included an answer key and rubric for you to use! 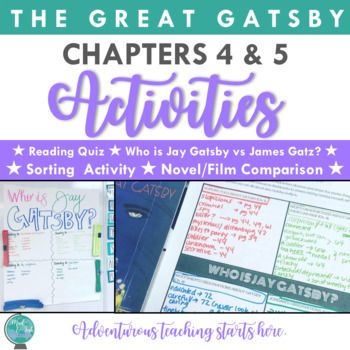 Chapters 1-5 - Character, Theme, Geography Plot Sort Digital Activity & Answer Key (SEE VIDEO PREVIEW! 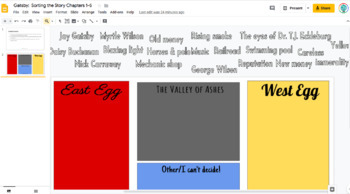 ): Using Google Slides, students will sort out terms, themes, setting elements and characters into four categories: West Egg, East Egg, Valley of Ashes, and Other. 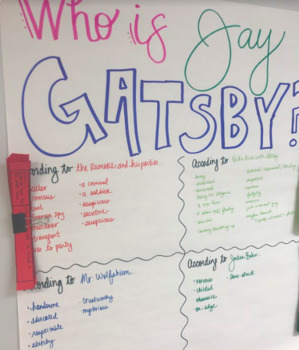 Students can work in pairs or small groups to determine where each word belongs, then, when you come back full class, defend where they placed each item. This is a great way to review what's been read so far before moving into the second half of the novel. 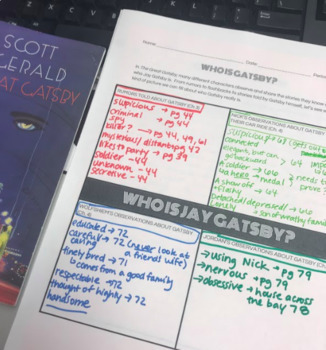 Movie/Novel Comparison with Clip 1 & Clip 2: Take students through these two specific scenes both in the novel and in the DiCaprio film version of the novel. The handout is completely editable and you are free to add any scaffolding or directions that you'd like kids to specifically adhere to. Love Haiku suggestions: Since this is the chapter where Gatsby and Daisy are reunited, we wrote some love poetry. This handout offers basic directions for quick haikus to write as a homework assignment. For more detailed haiku directions, lesson plan, and heart templates, check out my Love Poem for a Character product!